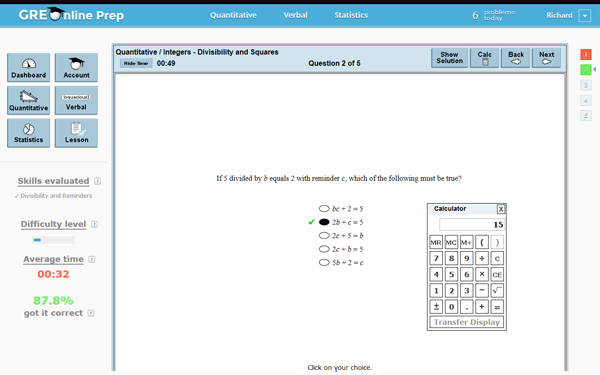 GRE Online Prep Course - practice GRE questions and improve your score! Improve your GRE Score. Guaranteed! Personalized dashboard with quick access to all features. 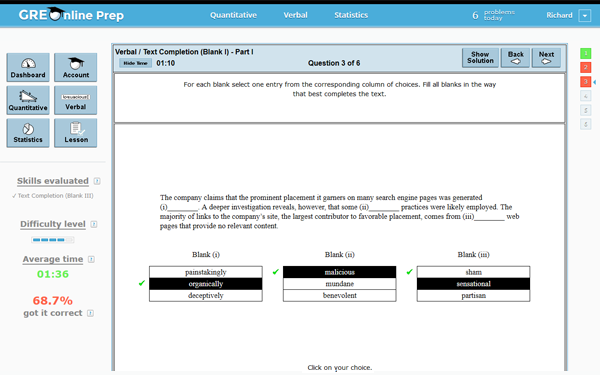 Problem interface completely resembles actual GRE test. Detailed performance analysis based on all variety of parameters. Comparison with average student's performance for each problem. 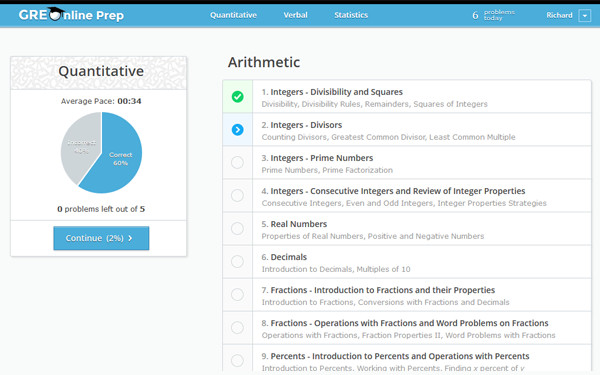 Extensive lesson library accompanied by huge problem database. So don't wait – sign up! For more details check features below or take a tour. What are you waiting for? Don't miss your chance, sign up! – help us improve it! to help you prep under realistic conditions. progress and customize your study plan. on the web, anytime, anywhere. abilities, and help you focus on preps. Want to check how it looks and feels? GRE is a very specific and tricky computer adapted exam that tests not only your quantitative and verbal skills but also your endurance and familiarity with a test format. You may have all the vocabulary and math knowledge you need, but if you're not familiar with the GRE peculiarities you won't score high. Only a significant amount of practice and high-quality test strategies will help you pass the GRE with the score you need to get accepted to your dream school. 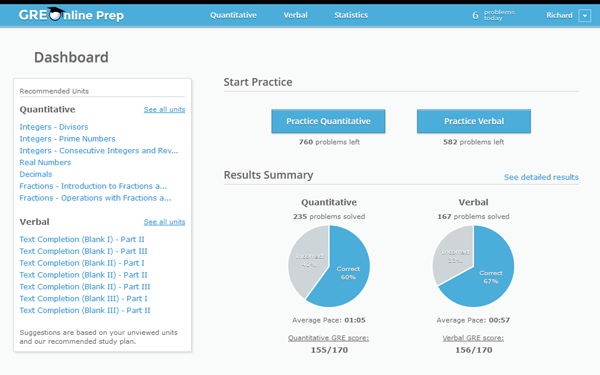 GRE Online Prep was designed exactly for these purposes, to fully resemble the GRE test interface in order to provide you with the best studying experience at an affordable price. Our practice questions are carefully chosen to teach you all the concepts that are tested on the actual GRE test and, therefore, on the test day you'll be familiar with a feel and look of the GRE and will be able to concentrate your attention on solving problems and scoring high. Besides the obvious benefits listed above, you will also increase your problem-solving speed, improve time management, build self-confidence, and gain valuable experience. As you may know, one of the biggest enemies on the GRE is time! 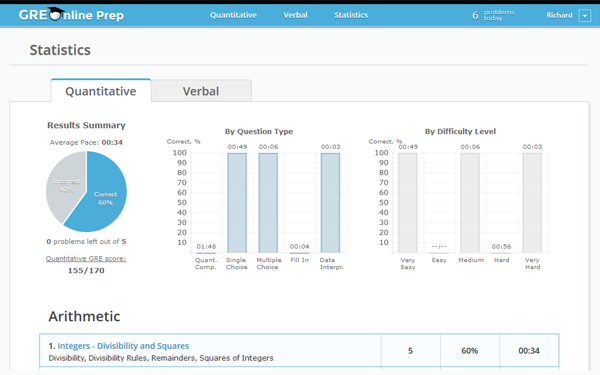 Even if you have all the verbal and quantitative skills to pass the test, but your problem-solving speed is too slow, you're not going to score well on the GRE. Only by having enough practice experience under realistic conditions you'll become aware of how much time it takes to answer each question. And soon you'll begin to develop an "internal clock" that will help you meet the pacing requirements of the GRE and improve your time management. GRE Online Prep can become your self-study guide with various handy tools to help, encourage, and make GRE preps more interesting and beneficial. So don't wait - sign up today!